I started my carrier as a porter hauling the heavy loads uphill and worked for many travel agencies. I had a experience of being porter, I know how it feels and how is the life of porter. At Yak Expeditions, we have a complete new form of management of Porters. The porters we hire are well insured. The managing director of Yak Expeditions; Ang Lhakpa Sherpa started his carrier as a porter. Porters are the backbone of Nepal's travel industry. Porters are the backbone of the Nepal's trekking industry and yet every year there are incidents involving porters suffering from Acute Mountain Sickness (AMS), snow blindness and frostbite. At time these illness have resulted in fatalities. There are some trekking companies in Nepal, especially at the budget end of the scale, who simply do not look after the porters they hire. This does not apply to all companies, but some seem to be more worried about their profits than the welfare of those who rely upon this occupation. Porters often come from lowland valleys, are poor and poorly educated, and are sometimes unaware of the potential dangers of the areas they are being employed to work in. Stories abound of porters being left to fend for themselves, wearing thin cotton clothes and sandals when traversing high mountain passes in blizzard conditions. At the end of each winter, a number of porter’s bodies are discovered in the snowmelt-they become tired, ill or affected by altitude and simply sit down in the snow, get hypothermia and die. The porters forced themselves to travel in the high mountains even they suffer from different kind of diseases or health problems. They keep their life on risk yet they are physically unfit. The only result is to earn money. I have been considering since a long time that the tips given by the clients are not fully given to porter. Therefore, we Yak Expeditions recommend you to give the tips (that you wish) directly to the porters. We provide all the necessary equipment like jackets, gloves, shoes, glass, caps as far as possible and we fully insured them. Porters of Nepal mostly come from the districts like Lower Solukhumbu, Okhaldhunga, Khotang, Nuwakot, Rasuwa and where most of the people depend upon porter occupation. Development of Tourism would have been never possible without the porters. 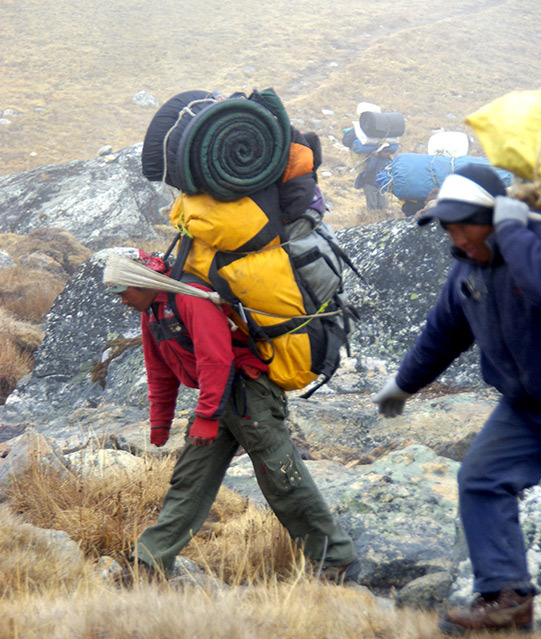 No tourist can trek above 3,000m without the porter. Hence, Porters are regarded as the backbone of Tourism Industry. Below mentioned are Nepal's most risky trekking routes for porters. We give more attention toward porters in these areas; the porters we hire will be well equipped and insured.